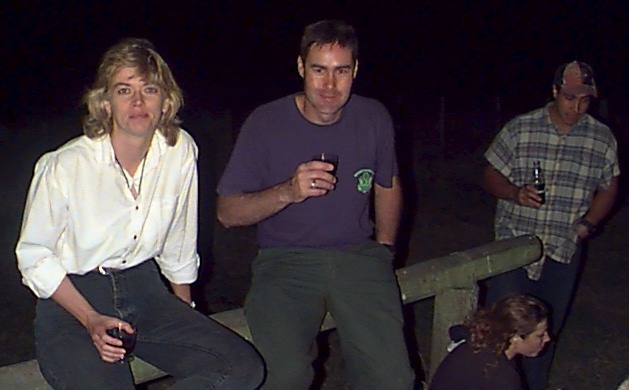 We had an interesting "moonlight" ride in a "remote area" near Wellington on Saturday night. 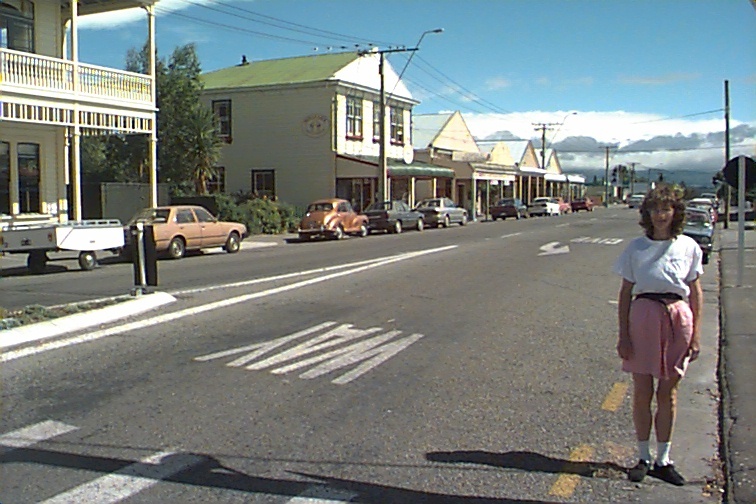 About 15 kilometers north of Wellington is the town of Johnsonville. 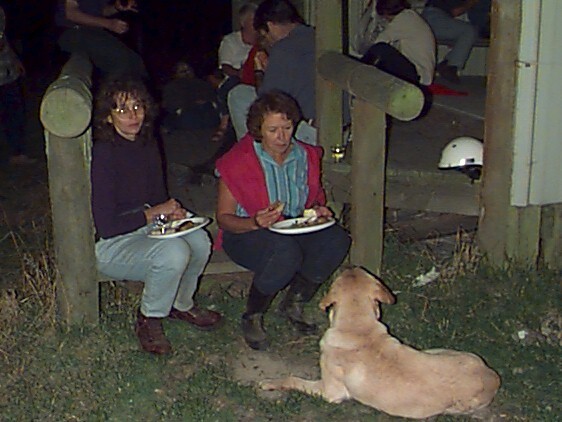 On the outskirts of Johnstonville we went to a riding stables which provides a moonlight ride and cookout. A group of about 35 of us were in the party and after mounting up we rode for about a kilometer to a lodge where the cookout was to be held. At this point we were told to decide whether we were 'in' for the three hour ride or whether we wanted to opt out. There were no quitters and off we went. 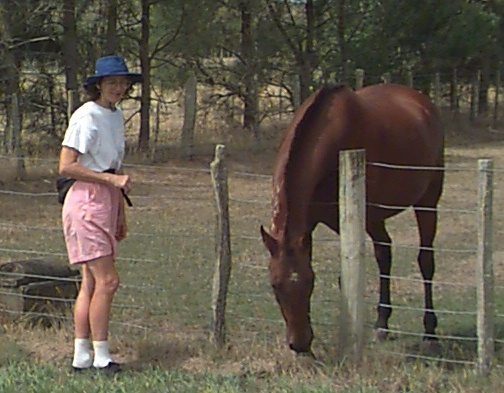 Although Christine and I didn't quit we weren't confident enough of our riding skills to take the camera along. 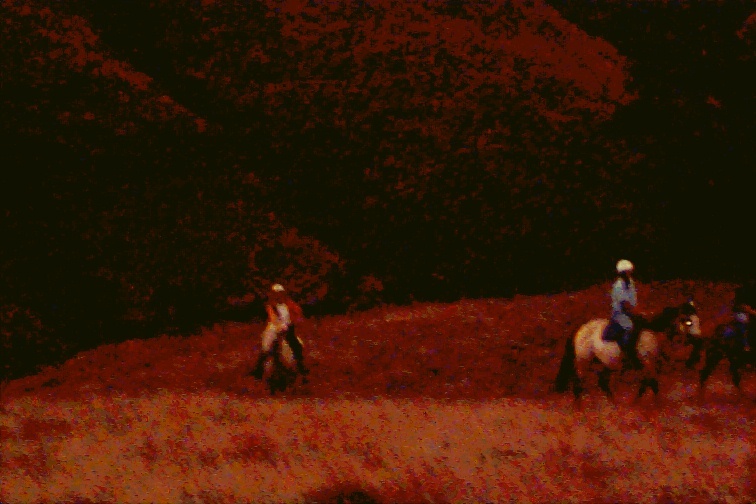 The result was that our first photos are take at dusk, by Christine, as the last of the riders rode in. Unfortunately the photos did not turn out too well. However the following two do give some idea of the terrain and the riders. Belowis a photo of Ken (wearing the ubiquitous yellow jacket) on his trusty steed Josh. Josh, a mare of 30 years has seen better days. However, here she is on the WWW, something she now brags to her stall neighbours about! Josh and I had some differences in philosophy. She (probably being older and wiser) wanted to stick to the trodden path. I always try to avoid the trodden path. Our compromise consisted of us being last in the group on both legs of the journey. 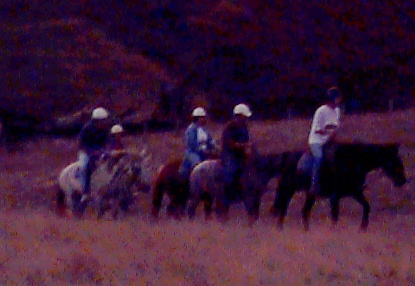 Not visible is the English saddle -- something most of we Americans were not used (particularly as we were frantically grabbing onto the saddle as we cantored up and down hills, some of which are discernable in this photo). Hills! That is an understatement. Apparently about 70% of New Zealand has terrain that is described as "steep". 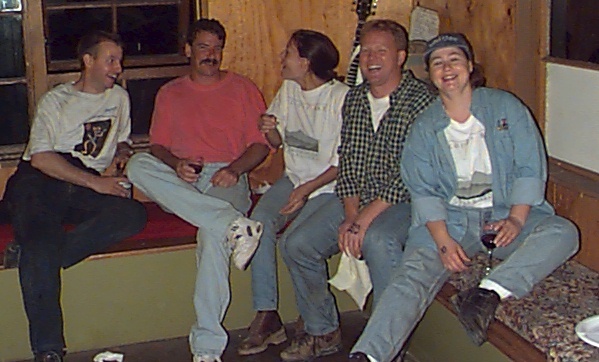 While most of us had ridden before, most of us had not ridden on slopes of 45 degrees or more in rough country. Certainly an interesting experience! I have concluded that a trip to New Zealand is like attending a confidence building course. The last part of the evening was the ride back to the base from the lodge; this done about midnight in pitch black. Fortunately, it appeared that the horses had known the way. We arrived back at our apartment about 12:30 in the morning. Martinborough is located in the Wairarapa (wai==water, rarapa==glistening) region to the west of Wellington. The next morning we were a little late getting up, but were soon on the road again, on our way to Martinborough. This is a community about an hour and a half drive from Wellington in a NE direction. Martinborough is best known for its wines, which according to the local marketing literature are world renowned. The first two photos were taken at the top of the pass as we moved over the hills from the Hutt valley into the Wairarapa country. The stop at the top has a plaque commemorating the first passage by white men, accompanied by their Maori guides in 1861. As near as I can tell the current road was built on their trail -- you can see it snaking up the valley in this next photo. Notice the steepness of the hills and the depth of the valley. 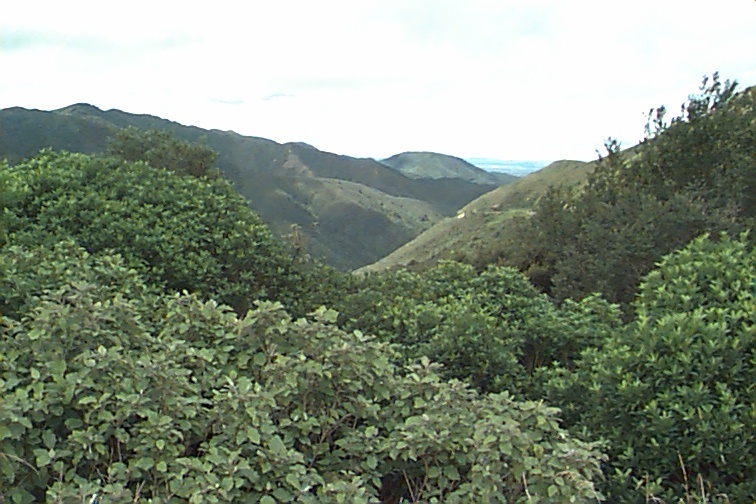 This is taken looking back towards the Hutt valley.